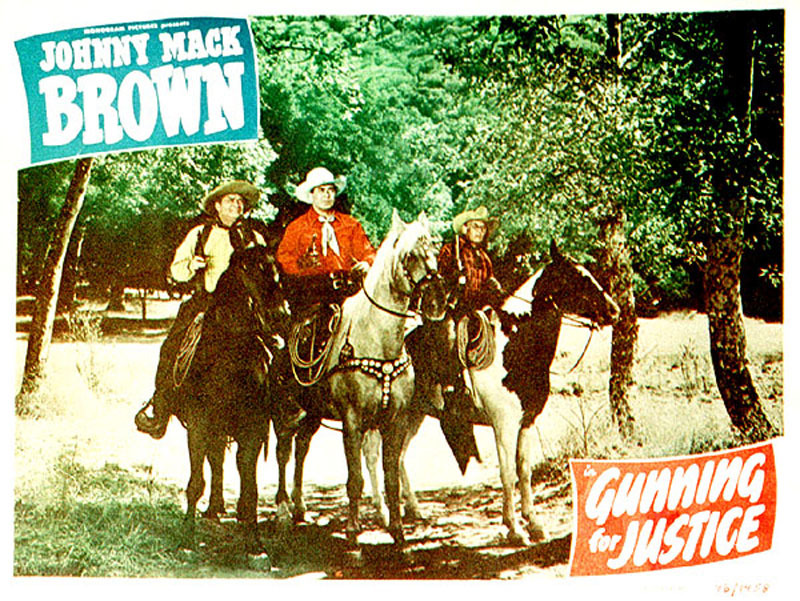 Johnny Mack Brown is "Gunning for Justice" through Placerita Canyon in this 1948 Monogram picture. The Monogram movie ranch covered more than 100 acres in Placerita Canyon. In 1952 it was purchased by Gene Autry and renamed "Melody Ranch." A contemporary of Autry, Bob Steele, Harry Carey, Hoot Gibson, Ken Maynard and Tom Tyler, Brown was one of the top ten "B" Western stars at the box office during the 1940s. Born Sept. 1, 1904 in Dothan, Ala., he appeared in 160 films from 1927 to 1953  of which more than 60 were for Monogram, starting in 1943. He died Nov. 14, 1974 in Woodland Hills from a cardiac condition. Released Nov. 7, 1948, "Gunning for Justice" was a 55-minute, black-and-white Western directed by Ray Taylor and written by J. Benton Cheney. Brown and Raymond Hatton starred; also appearing were Ted Adams, Dee Cooper, Evelyn Finley, Carol Henry, I. Stanford Jolley, Artie Ortego, Bud Osborne, House Peters Jr., Bill Potter, Boyd Stockman, Max Terhune, Dan White and Bob Woodward.